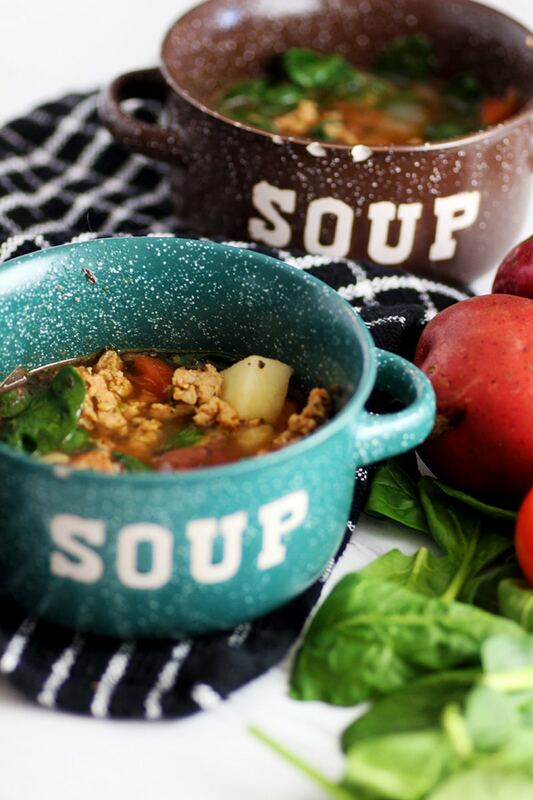 A creamy, comfort food soup recipe with sausage and potatoes, packed with flavor in every single spoonful. 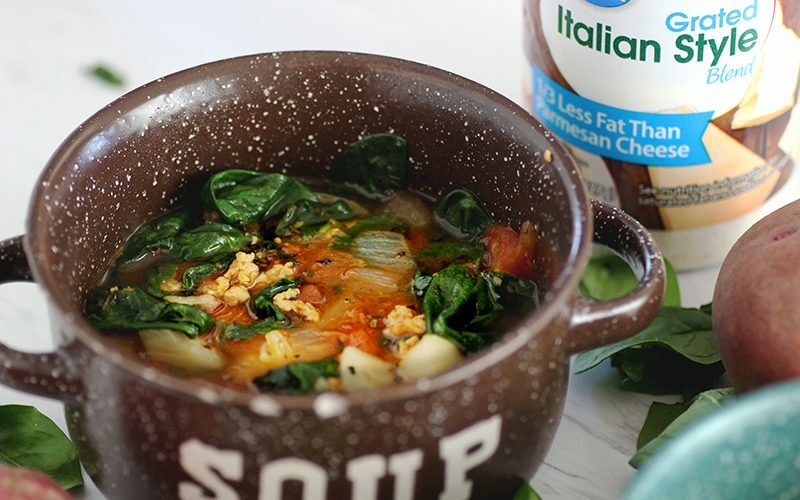 This Olive Garden Copycat Zuppa Toscana soup recipe is perfect for the winter months. 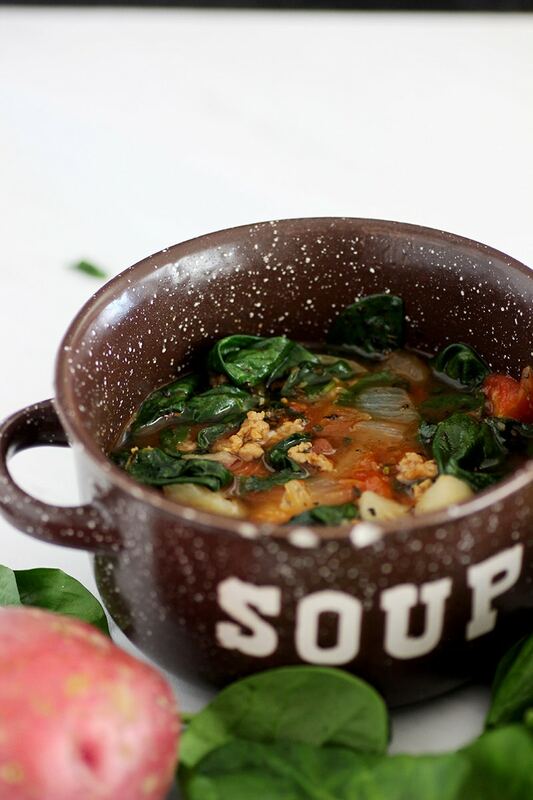 Have you ever had Zuppa Toscana soup from Olive Garden? If you dared to answer no, that is gonna change today. I'm talking life change here! I imagine you ended up here on the hunt for a good soup recipe or intrigued in some way when visiting another post. I can assure you that this is a good stop you have made, and it does not disappoint. One of the reasons I personally wanted to leave Ohio was because of the dreary winters. The dark dreary skies would lead me down a road of seasonal depression. And when I feel that way, all I want to do is eat. Usually, stuff that is completely bad for me. Here in NC, although we are not exempt from the cold, we get a great amount of sunshine. So while I am not sulking and stuffing my face, I am still always preparing good food that the family and I love! It's rounding out to hopefully the end of wintertime around these parts. While I personally can do soup all year long, I realize the winter is when most ‘regular' people like to indulge. One of my favorites of all time is the Zuppa Toscana soup from Olive Garden. But then I stopped eating pork and I could no longer indulge in my favorite soup. The chicken gnocchi is a good second option though. And if that is more your speed, I have a Copycat Chicken Gnocchi soup recipe for you too. Cause really Olive Garden has a good soup for all of us. I just love LOVE Love Olive Garden soups. Life has changed. And for the good my friends. At least in my kitchen. Which is really all I can focus on because the rest of the happenings are way too overwhelming. Ya girl has made a soup that tastes just like Zuppa Toscana. Made with a tomato base, and broth, loaded with taste and flavor. The only exception is that it is made with turkey meat. That means I can have it all day long, and twice on Sunday if I want to! Can you tell that food makes me happy? 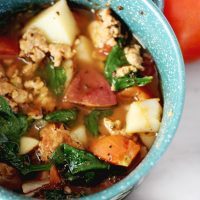 So I am sharing with you a Turkey version of the Olive Garden exclusive Zuppa Toscana soup and I hope that you love it just as much as I do; dance and all. You'll need to start out with prepping your potatoes. Cutting up 4 cups of potatoes. 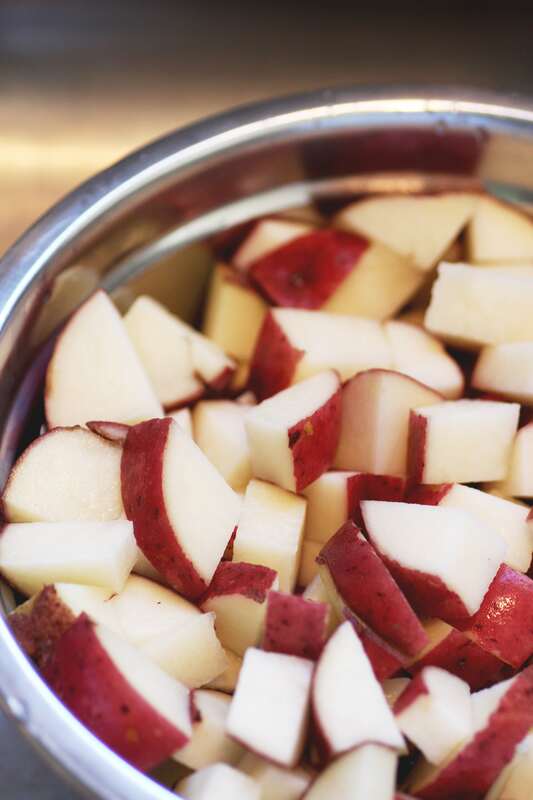 I have a preference for red skin potatoes, but you could also use russet potatoes as well. Boil the potatoes for about 15 minutes, or until they are soft enough for the fork to go into. The drain them and set them aside. I remove the skin from the sausage before cooking it. Heat up the oil in a large pot over medium-high heat and add the garlic and diced onion. Saute those together until the onions are soft. Add in the sausage and crumble it. Cook it until the sausage is no longer pink. Once the sausage has no pink left, stir in broth and add crushed tomatoes, potatoes, basil, salt, and pepper. Bring it to a boil, and reduce the heat to low, and cover. Let the soup simmer for 20-30 minutes to allow the potatoes to fully cook and absorb the flavor. Then add in the half & half and spinach. Simmer for an additional five minutes and it is ready for you to enjoy! 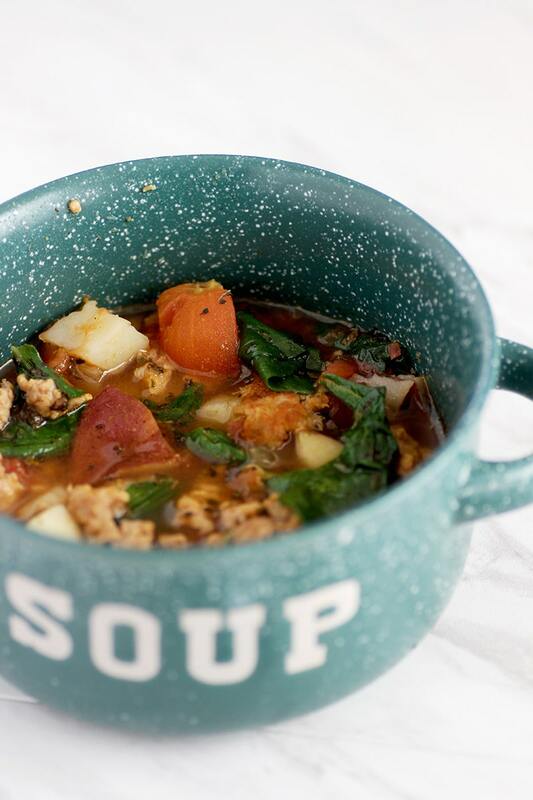 This soup tastes like zuppa toscana soup from Olive Garden. 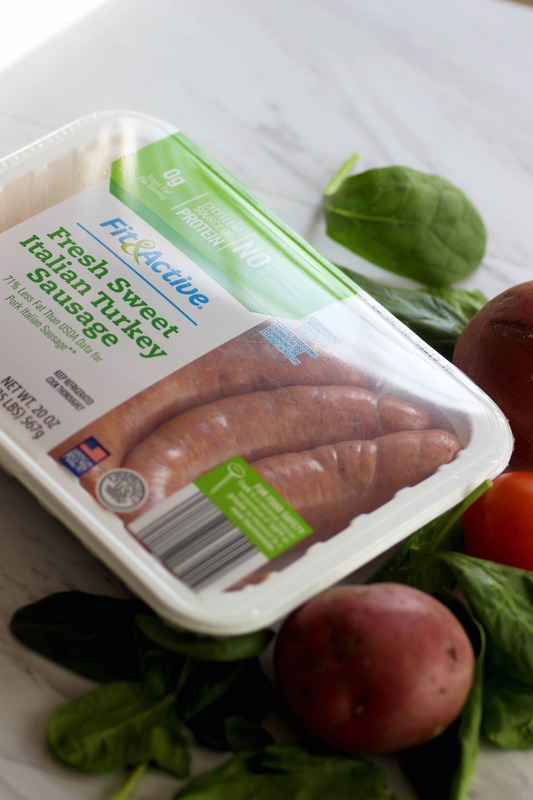 The only difference is that it is made with turkey sausage instead of pork. Boil potatoes for 15 minutes, or until just soft. Set aside. Add oil, garlic, and add diced onion. Saute until onions are soft. Add sausage. Crumble Italian Sausage. Cook until sausage is no longer pink. Stir in crushed tomatoes, potatoes, broth, basil, salt and pepper. Bring to a boil, reduce heat to low, and cover. Add in half & half and spinach. Simmer for additional five minutes. 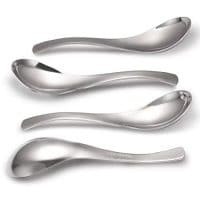 Can serve with shredded parmesan on top. 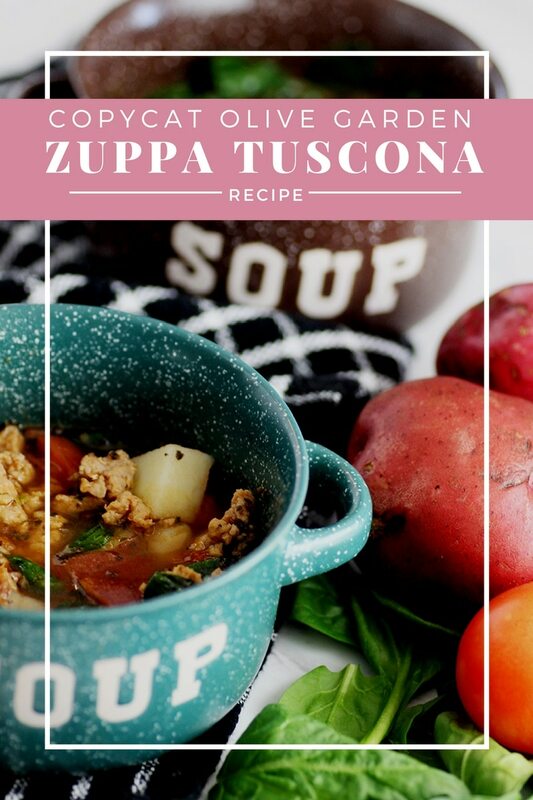 INTERESTED IN MAKING OLIVE GARDEN COPYCAT ZUPPA TOSCANA SOUP RECIPE? YOU CAN PIN IT AND SAVE IT FOR LATER WHEN YOU ARE READY TO MAKE IT USING THE BUTTON BELOW! Oh this looks soooo good! 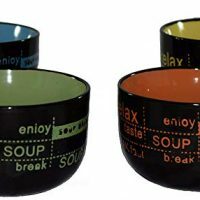 I love a good soup and have been searching for recipes! My husband loves this soup from OG. I haven’t tried making it, but this sounds so easy and delicious I may have to try it soon! I make this for my family as well! I’ll have to try yours with the tortellini ! Awesome! My boys love Olive Garden and want to go every week. Glad to see we can save the cash and make it at home–and without the pork! I’ve never had the soup at Olive Garden, glad you were able to make your own healthy version at home. Sounds good! Ooh! I love Olive Garden’s soup! I may have to give this a try! Thanks for sharing! This looks really good. I’m adding it to my list of recipes to try. Thanks for sharing. This sounds so good. It’s like I can smell it lol. I’m happy you found this and even happier you passed it down to us. I’m definitely trying.